A glitch with a Russian spacecraft has helped clear the way for a private capsule's first contracted cargo flight to the International Space Station early next month, NASA officials say. Russia's Soyuz TMA-06M spacecraft was originally set to launch three astronauts toward the station on Oct. 15. But the Soyuz's liftoff will be delayed by about a week while technicians install a replacement part to fix a technical issue, Russian space officials announced Sunday (Sept. 16). The window is thus open fairly wide for SpaceX's Dragon capsule to blast off in the first two weeks of October. "The new launch date will help de-conflict the station's schedule for the upcoming launch of the SpaceX Dragon spacecraft," NASA's Amiko Kauderer said in an International Space Station mission commentary yesterday (Sept. 17). Dragon could lift off from Florida's Cape Canaveral Air Force Station as early as Oct. 9 or Oct. 10, officials have said. California-based SpaceX holds a $1.6 billion contract with NASA for 12 robotic cargo runs to the orbiting lab, and October's flight will be the first of these 12. But it won't mark the capsule's first visit to the space station. 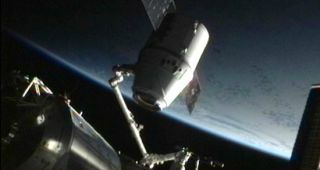 In May, Dragon became the first private spacecraft ever to dock with the $100 billion orbiting complex during a historic demonstration flight. NASA also signed a $1.9 billion contract with Virginia-based firm Orbital Sciences Corp. to make eight robotic supply runs to the station with its Cygnus spacecraft and Antares rocket. Orbital plans to fly a demonstration mission to the orbiting lab later this year. Three astronauts departed the space station over the weekend, leaving just three crewmembers aboard the 430-ton orbiting complex. The Soyuz TMA-06A will bring the current Expedition 33 to its full complement of six crewmates, delivering NASA astronaut Kevin Ford and Russian cosmonauts Oleg Novitskiy and Evgeny Tarelkin to the station.